In our last post, we examined reasons why line workers have one of the most dangerous jobs in America. More than just the risks of high voltage lines and working from large heights, another significant impact on field safety is lack of access to good data regarding current field conditions. Without this information, line workers often are not appropriately prepared for what they find in the field. Years ago, when most utility poles supported little more than power and telephone cables, infrequent inspections were sufficient to keep up with maintenance. However, the landscape has changed dramatically in recent decades. The fast pace of growth—exponential increases in the number of attachers and services offered, along with the large impact of storms and wildfires—means the historic approach to infrastructure asset management no longer works. Inspecting each pole once every eight-to-ten years is no longer enough to maintain reliable service, keep field workers and customers safe, nor manage systems of power and communications across the U.S. However, with asset owners holding the liability for their utility poles, conduit vaults, and other assets, industry-standard schedules are often drawn out, especially when multiple attachers are on a pole and equipment transfer is required, for example. A shortage in skilled asset management professionals, combined with the ballooning costs of conducting inspections, means that many companies fall behind in their pace and capacity to keep up. So, what are asset owners to do? One potential solution is to take advantage of the growing number of attachers by establishing a collaborative inspection process for every person who visits an asset. Right now, lots of people are observing the plant on a regular basis, but typically only paying attention to their own immediate concerns. For example, a telecommunications employee who is sent to investigate a service interruption may notice signs of insect damage on the pole – but without a simple, shared system and an imperative to report such conditions, that information is useless. Or consider a broadband provider who has received permission to attach is hanging equipment and sees that the pole is leaning or has a buddy pole that should be removed. Without a good process to quickly share those concerns, nothing is immediately done because no one knows to do it. 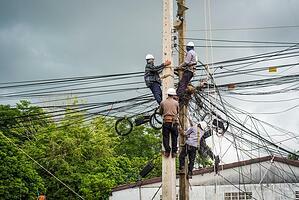 The risk remains until a future inspection, or until the pole fails. Many skilled people are observing today’s plant—field workers for the wide range of attaching companies—but the lack of an industry-wide method for reporting and sharing information about current field conditions doesn’t currently exist. This lack of accessible data leads to unnecessary safety risks. Electric utilities, telecommunications companies, CATV providers, and broadband providers would benefit greatly from leveraging these collective resources to better understand the realities of what’s out in the field. This approach cannot and will not replace the necessary inspection process typically required every 8-10 years that includes owner identification, equipment tagging and scanning, rot testing, violation reporting such as NESC, GEO95 or state-specific standards, photo collection, and structural inspection. However, it could enable a more frequent update on any given asset’s field condition, which in turn can help create greater field safety and improved plant maintenance. In the next post, we’ll go into detail about how asset owners and attachers can make this happen using a shared, centralized asset database. Does your organization have any processes in place to collect asset field condition data outside of typical inspections? Tell us how they work in the comments below.